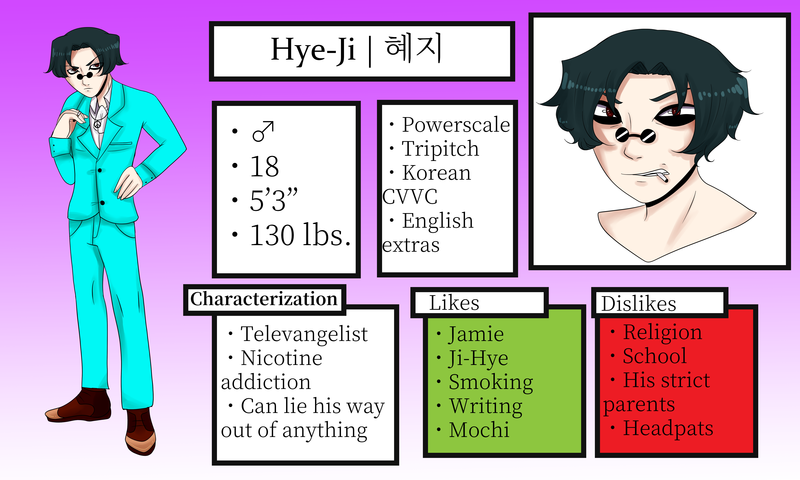 Hye-Ji has two voicebanks, his most recent being a tripitch, powerscale CVVC voicebank. He has English extras for ease with English in Korean songs. Hye-Ji's first bank is encoded in CV Romanized Korean, and is intended for those just starting with Korean banks. He has some sounds included for ease with English, as English is frequently used in Korean mainstream music. Hye-Ji and his twin sister, Ji-Hye, were born to upper class parents in the suburbs of Upper Montclair, New Jersey on October 5. Hye-Ji and his sister were often judged for having well-off parents, as well as mocked for their taste in fashion. As Hye-Ji got older, he began to stand up for himself, often getting into fights with other students. His parents attempted to stop this behavior by placing the twins in a private, Catholic school, but this failed as Hye-Ji and Ji-Hye only rebelled more. Hye-Ji and Ji-Hye's behavior eventually got them expelled. Before their parents could return from work, they packed all their money, clothes, and other necessities and started hitchhiking across the country. After securing a cheap apartment, the two created a gimmick to get income: Hye-Ji would become a televangelist preacher, convincing gullible viewers to donate money to his "cause," only to pocket the money for him and his sister. Ji-Hye would control most of the technical aspects, as well as making appearances for musical segments. Starting online, the two enjoyed much success on YouTube and other social medias. 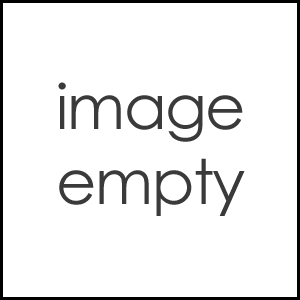 Eventually, they gained a spot on public access television, and were able to pull in their online audience, as well as another group that weren't versed in the Internet. Hye-Ji and Ji-Hye were thrust into the mainstream Christian consciousness, becoming an almost overnight success with the community. The twins are happy to keep the lie going as long as it supplements an income. Hye-Ji is a convincing public speaker, being able to be calm and collected during interviews while simultaneously having tons of passion and energy onstage. Currently, Hye-Ji and Ji-Hye tour internationally, spreading a facetious word of God to everyone who will listen. To keep himself going and level, Hye-Ji smokes cigarettes, to the point he has developed a dependency on them. Hye-Ji only cares for his sister and a man named Jamie Ueda, a young drag queen who is very amused by Hye-Ji's act. Hye-Ji and Ji-Hye are exceptional at keeping the public in the dark about who they really are and what they're really doing, and can easily dissipate any rumors about themselves.